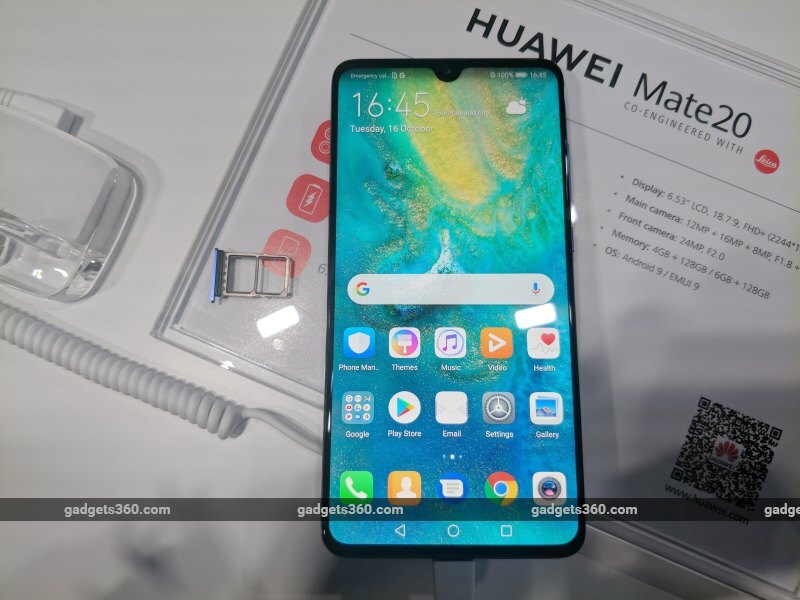 Huawei launched the latest generation of its Mate flagship series at an event in London on Tuesday, and Gadgets 360 was at hand to spend some time with the three new smartphones. The Chinese telecommunications giant unveiled the Mate 20 Pro, the Mate 20, and the Mate 20 X, all of which have some similarities in terms of their designs, features, and specifications. The biggest attraction of all three smartphones is their triple rear camera setups, a trend started by Huawei itself with the P20 Pro. Also worth noting is the new 40W Huawei SuperCharge technology, as well as fast wireless charging and wireless reverse charging. Here are our first impressions of the Mate 20 Pro, the Mate 20, and the Mate 20 X. Looking a bit more at the design aspect, Huawei has used curved glass on both the front and back of these new smartphones. Both the Huawei Mate 20 Pro and the Mate 20 will be shipped in the same colour options — Black, Emerald Green, Midnight Blue, the gradient finish Pink Gold, and the Twilight colours that we have already seen on the Huawei P20 Pro (Review) and Honor 10 (Review). All of them feature a contoured finish that the company calls a Hyper Optical Pattern, described as being easier to grip and less prone to fingerprints. The Mate 20 X on the other hand comes in only two colour variants; Midnight Blue and Phantom Silver, both with the same textured glass finish at the rear. All three phones look great, and are certainly attractive. The phones did indeed feel less slippery compared to some other glass-backed devices we have used. However, that being said, all three did still appear to pick up quite a few fingerprints in the time we spent with them. You might still want to use a case to prevent the otherwise good-looking exterior of any of these phones from becoming unsightly. All three phones have their power button and volume rocker on the right side, with the SIM card tray location varying. While the Mate 20 and Mate 20 X do have 3.5mm headphone jacks, the Mate 20 Pro foregoes this, requiring users to utilise the USB Type-C port — available on all three phones — instead. All three smartphones also have display notches to house their front cameras and earpieces. The Mate 20 X and Mate 20 feature a ‘Dewdrop' notch, while the Mate 20 Pro features a more conventional notch thanks to the numerous other components it requires for 3D face recognition. 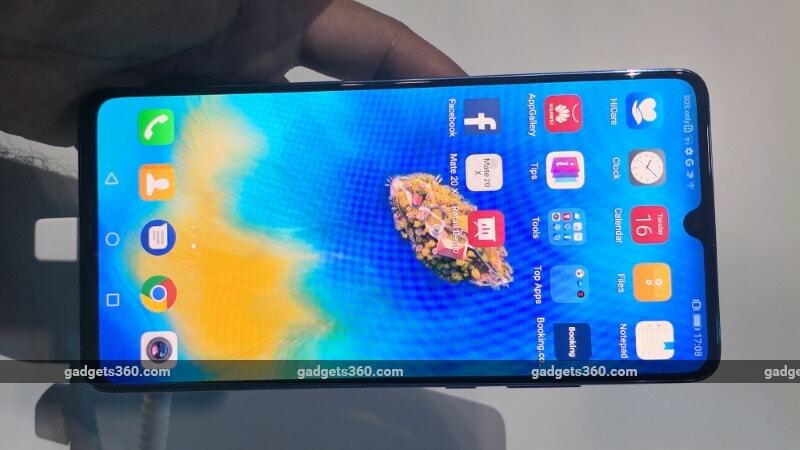 The top-end Mate 20 Pro also boasts of an in-display fingerprint sensor, with the other two settling for conventional fingerprint sensors on their rears. The displays of all three smartphones were bright, with good contrast, viewing angles, and colour vividness, though a little on the oversaturated side, in our opinion. While the Mate 20 has an 6.53-inch full-HD+ IPS display, it has an impressive claimed brightness of 820 nits, thanks to the company's RGBW technology. The other two smartphones have OLED displays that seem to have no visible flaws. The Huawei Mate 20 Pro has a 6.39-inch 2K+ panel, and the Mate 20 X has a 7.2-inch full-HD+ display. Huawei says the three phones support HDR output. The three new Mate 20 smartphones are also the first to run EMUI 9.0, based on Android 9.0 Pie. It includes features like HiVision visual search, AI-based photo and video enhancements, 3D modelling, 3D Live Emojis, and more. A wireless projecting mode is also being touted. The triple camera module on all three new phones has a square shape, compared to the vertical strip on the P20 Pro. According to the company, it's inspired by the headlights of sports cars. The setups used for the Mate 20 Pro and Mate 20 X are identical: one 40-megapixel wide-angle camera, one 20-megapixel ultra-wide-angle camera with a lens made by Leica, and one 8-megapixel telephoto camera. The Mate 20 has the same types of cameras, but with more basic 12-megapixel, 16-megapixel and 8-megapixel sensors respectively. This combination appears to be quite useful, giving users features like wide-angle shots, optical zoom, and Bokeh effects. The camera app on board – which we felt was quite easy to use – also offers features like a Pro mode, Night mode, Aperture Mode, and Portrait mode, apart from smart scene and face recognition features. All three smartphones also have a 24-megapixel front camera with an f/2.0 aperture, though the Mate 20 Pro has additional 3D sensing capabilities. Huawei is also boasting of ‘Fullview' gesture-based navigation, which other manufacturers have implemented, and Google itself has baked into the latest version of Android. Another highlight of the smartphones is that they all support Huawei's newly unveiled Nano Memory Card, which is a proprietary storage card standard that takes only as much space as a Nano SIM. Huawei says it is 45 percent smaller than a microSD card. The Nano Memory Card will be available in capacities of up to 256GB. Unfortunately, all three phones still have hybrid slots, which means that you can use either a second SIM or a Nano Memory Card, but not both at the same time. All three new Mate 20 smartphones use the company's new octa-core HiSilicon Kirin 980 SoC, which is manufactured using a 7nm fabrication process. It consists of two Cortex-A76 cores clocked at 2.6GHz, two Cortex-A76 cores clocked at 1.92GHz, and four Cortex-A55 cores clocked at 1.8GHz. All three models also support Huawei's GPU Turbo v2.0 feature for accelerated gaming. The Mate 20 Pro comes in two options: one with 6GB RAM and 128GB storage, and the other with 8GB of RAM and 256GB of storage. The Mate 20 comes in 4GB RAM and 6GB RAM options; both with 128GB of storage. Finally, the Mate 20 X comes in a single configuration with 6GB of RAM and 128GB of storage. All three smartphones have relatively large batteries, with the Mate 20 sporting a 4,000mAh unit, the Mate 20 Pro getting 4,200mAh unit, and the Mate 20 X coming in at 5,000mAh. All three phones come with bundled 40W SuperCharge adapters and cables in their boxes. On the Mate 20 for example, users should be able to get up to a 25 percent charge in 10 minutes, and 80 percent in 30 minutes. There is also Huawei's Wireless Quick Charge feature, which can take advantage of 15W charging pads to deliver a 12 percent charge in 10 minutes and 30 percent in 30 minutes. The most interesting new charging option is Wireless Reverse Charging, though this is exclusive to the Huawei Mate 20 Pro. It lets users charge other Qi-compatible smartphones or accessories using the Mate 20 Pro, simply by touching them back to back. The process appeared quick and seamless in our brief experience. As for what these phones will cost, the Huawei Mate 20 is priced starting EUR 799 (roughly Rs. 67,900) for the 4GB RAM/ 128GB storage variant, going up to EUR 849 (roughly Rs. 72,100) for the 6GB RAM / 128GB storage variant. On the other hand, the Huawei Mate 20 Pro's price is set at EUR 1,049 (roughly Rs. 89,100) for the sole 6GB/ 128GB configuration. Both these phones are already available in select European markets. The Huawei Mate 20 X is priced at EUR 899 (roughly Rs. 76,400) with 6GB of RAM and 128GB of storage, and will go on sale from October 26. For now, no details of these phones' pricing and availability in India has been announced. Stay tuned to Gadgets 360 for all this information and detailed reviews of all three models when they go on sale in India. Disclosure: Huawei sponsored the correspondent's flights and hotel stay for the event in London. product Huawei Mate 20 Pro, the Mate 20, and the Mate 20 X were unveiled in London on Tuesday.